Broad City premiered on Comedy Central in January 2014, making overnight stars out of BFFs Abbi Jacobson and Ilana Glazer. Since then, the comedy duo has given us so much -- three hilarious seasons, a texting keyboard app, the perfect rebuttal to "You should smile more," a foolproof exit strategy, and a motto to live by, to name just a few. Like Nutella and banana, Abbi and Ilana are great either together or apart. While on hiatus from Broad City, they've kept busy working on separate projects. 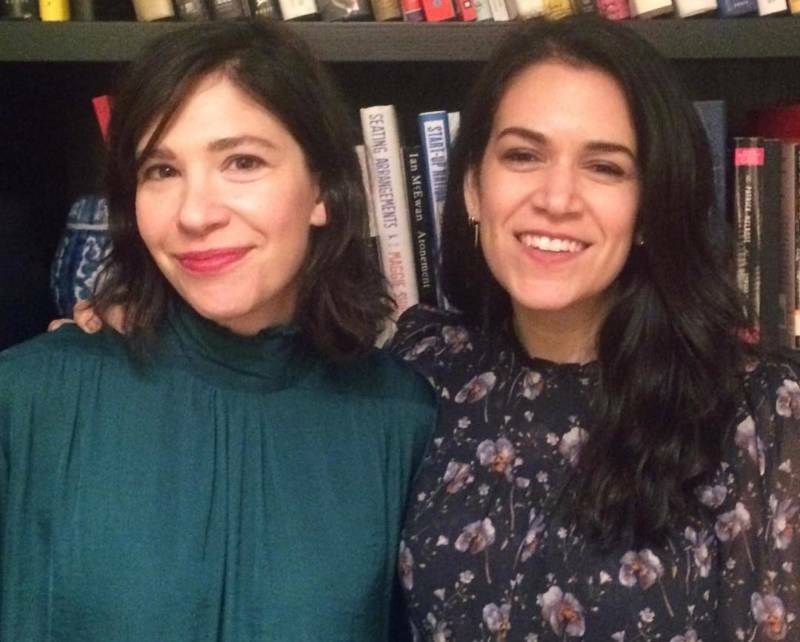 On Saturday night, Abbi passed through San Francisco for a City Arts & Lectures event, hosted by Carrie Brownstein of Sleater-Kinney and Portlandia fame, to talk about hers: an illustrated book titled Carry This Book, which imagines what an assortment of famous and fictional people have in their bags. Carry This Book was inspired by Tim O'Brien's The Things They Carried, a collection of short stories about the Vietnam War. Abbi read it in middle school, and the way O'Brien defined each of his characters by their objects stuck with her. The publishing company was too nervous about potential legal trouble to put Harry Potter in the book, but they took the risk with Donald Trump, which is a-OK with Abbi: "I don't think there's anything in there that anyone would sue me for," she said, "but Donald Trump just sues anyone for anything. That'd be awesome. That would be so crazy if he sued me for my illustrating book." She insisted that mistakes she made while creating the book be kept in the final product, except for one: "The one mistake that I had them fix because I was like, I can't, I'm a f-ing idiot; Hillary Rodham Clinton was spelled wrong. I left out the 'h' and they didn't catch it and I got the proofs back and I was like 'Rodam?!? You guys, pop me an 'h' from somewhere else in the book. We gotta drag it up in there.' They did, so now you know I'm a phony. I'm a fake!" Hillary Clinton's cameo on Broad City will make it into the final montage of Abbi's life experiences: "When I die, that moment when I say I pegged to Hillary Clinton, gotta be top 5." 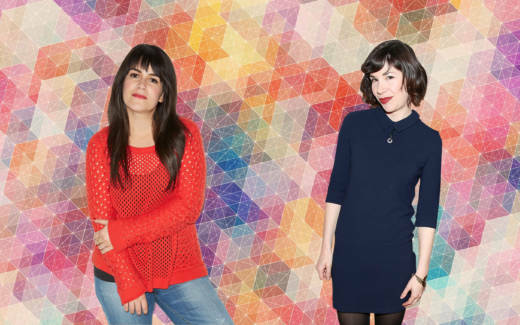 Broad City would have never existed were it not for... AOL? Abbi and Ilana once worked next to each other at a Groupon-esque company called Lifebooker, an experience that is reflected in the show through Ilana's job. As you might guess, the gig wasn't exactly profitable, but everything changed when Abbi got a couple grand for an illustrating job at AOL. She put the money toward pitching Broad City and the rest is herstory. While we're on the topic, Abbi still has an AOL email address. "Figure it out. Try a couple out." 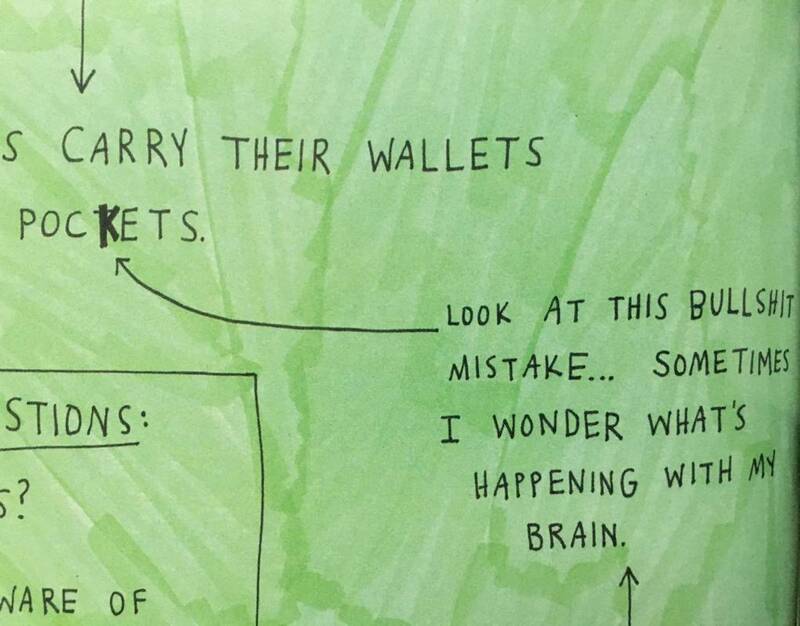 We also have AOL to thank for Broad City’s rad opening credit illustrations. They're the work of Mike Perry, an artist who was hired to do the same rebranding work as Abbi at AOL. Carrie: "What about the term 'dopp kit'? Do you guys know this term?" Abbi: "Are you saying D-O-B?" Carrie: "I don't know! I don't know what I'm saying. Is it a men's toiletry bag?" Abbi: "I read that book and I didn't really do it. That's why she's so rich. Everyone is like 'I read it. I didn't do it, but I read it.'" Carrie: "The one thing you can't get rid of is the guilt you feel after you read it." Comedy wasn't Abbi's first love. Visual art came first, as a sort of inheritance; everyone in her immediate family is an artist. After receiving her degree in Fine Arts from Maryland Institute College of Art, Abbi was bitten by the acting bug. She moved to New York to take part in a two-year conservatory in an effort to become a dramatic actress. She lasted one week. Her favorite Broad City scene was improvised. Fans of the show might remember Ilana and Lincoln, played by Hannibal Buress, making out in a dentist's office. The plan was for Abbi to just awkwardly stand there. But Ilana flipped the script by trying to get Abbi in on the action. Abbi tapped into her improv training and responded with a Yes, and... I'm going to roll away from this situation. Abbi likes to listen to Philip Glass while writing. "Which is so depressing when you're writing a comedy show." Abbi is in love with The Great British Bake-Off. "It's so good! The stakes are so low! They always say the words 'soggy bottoms' and 'is the crust flakey enough?' and it's just normal people, everyday people that have other jobs and they come in on the weekend to the tent and they're cooking and... I just love it!" 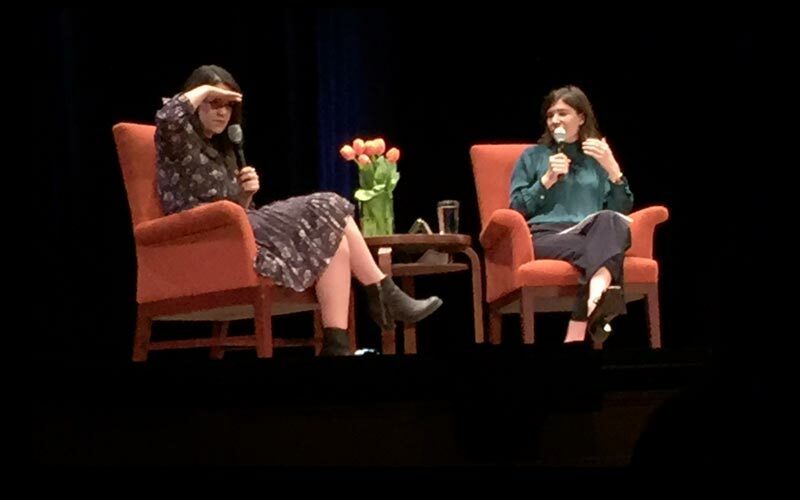 The radio broadcast of Abbi Jacobsen's talk with Carrie Brownstein at City Arts & Lectures airs on KQED 88.5 FM or KQED.org on Sunday, Nov. 6, at 1pm and Tuesday, Nov. 8, at 8pm.